You are amazing! 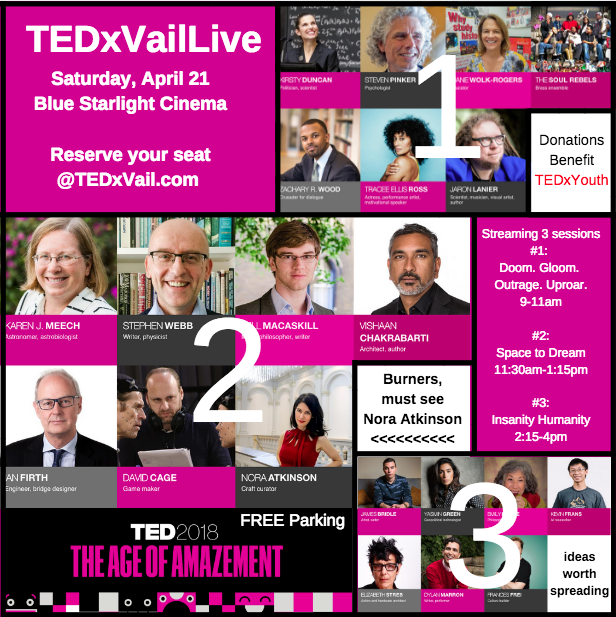 TEDxVailLive streams 3 sessions of TED's The Age of Amazement. So for TEDxVailLive, we'll be tapping into 3 Sessions of the TED Conference with an expanded curatorial group and going all-out to bring you visibility into the key developments driving this future, from jaw-dropping AI to glorious new forms of creativity to courageous advocates of radical social change. We'll include critics and skeptics, but also the quiet heroes driving ideas we can rally around. And through it all, we'll seek an exciting and insightful way forward. Session 1: Doom. Gloom. Outrage. Uproar. - see Steven Pinker, a professor of cognitive science (the study of the human mind), interested in all aspects of human nature: how we see, hear, think, speak, remember, feel and interact. In his latest book, Enlightenment Now: The Case for Reason, Science, Humanism, and Progress, he writes about progress -- why people are healthier, richer, safer, happier and better educated than ever. Session 2: Space to Dream - with Nora Atkinson, Curator of Smithsonian's Burning Man "No Spectators"
Session 3: Insanity Humanity - including Dylan Marron takes complicated social issues and finds accessible ways to talk about them through interviews, short-form videos and satire.